Western Digital introduced a new line of WD TV Live streaming media players with WiFi support and compatibility with the Spotify music service. Western Digital® (NYSE: WDC), the world's leader in external storage solutions and maker of the popular WD TV® media player family, today introduced the next generation of its WD TV® Live™ streaming media player, an easy to use Wi-Fi® enabled media player that is the first in its category to deliver the Spotify® music service. WD TV Live features WD's newest intuitive user interface that delivers the latest hit movies, TV shows, music and online services from companies like Netflix®, Hulu Plus™ and Blockbuster® directly to your TV. The new streaming media player connects to the Internet wirelessly or through an Ethernet connection, with the high performance 802.11n wireless connectivity supporting Full-HD 1080p video resolution. In addition to premium Internet content, WD TV Live allows users to enjoy personal media such as photos, video and music on their home entertainment systems by supporting a wide range of file formats for streaming content from any connected USB drive, digital camcorder or camera, network drive such as the My Book® Live™ personal cloud storage, and any networked PC or Mac® computer in the home. Adding to the WD TV family's current content offerings from Netflix, Hulu Plus, Blockbuster, CinemaNow®, Pandora®, YouTube™, Facebook® and many others, WD TV Live and WD TV® Live Hub™ are the first streaming media players to deliver Spotify's acclaimed music service. Premium Spotify subscribers can now enjoy unlimited on-demand access to Spotify's catalog of over 15 million songs in excellent sound quality (available in up to 320kbps) on their home entertainment system. WD incorporates Spotify's popular features in the new service, including the ability to create and manage Spotify playlists, share songs to Spotify friends, and see and subscribe to friends' playlists via their Spotify profiles. Users can also share tracks by sending songs directly to other Spotify users' inboxes. Spotify for WD TV Live and WD TV Live Hub delivers an exciting new way to enjoy and share music on the best sound system in your home. "WD is committed to providing our customers with a premium entertainment experience that includes seamless streaming of personal media and the best of the Internet directly to the highest quality screen and sound system in the home," said Jim Welsh, executive vice president and general manager for WD's Branded Products and Consumer Electronics groups. "By marrying advanced features of the new wireless WD TV Live with quality content from service providers, including a first of its kind service with Spotify, we are excited to deliver on that commitment." Pascal de Mul, Global Head of Hardware Partnerships, Spotify, commented: "We're really excited to make further steps into the living room with the streaming media players from Western Digital, which from today offer the full Spotify streaming catalog in a truly innovative TV-focused user experience." In addition to Spotify and WD's current content offerings, WD TV Live and WD TV Live Hub will also now include the Dailymotion video service. The application offers quality video content from users, independent content creators and premium partners, including high-quality and HD video. 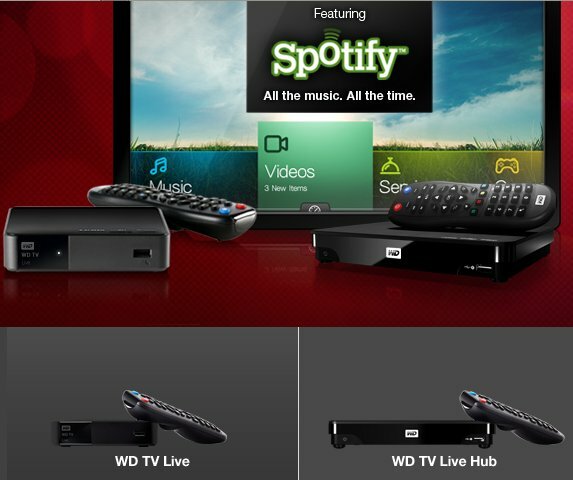 The new WD TV Live streaming media player can be purchased at select retailers worldwide and online at wdstore.com. MSRP for the WD TV Live streaming media player is $99.99 USD. Spotify is now available on the new WD TV Live players, as well as the WD TV Live Hub streaming media player, which features a built-in 1 TB hard drive to store personal content locally for TV streaming. The Spotify service is available in eight countries: USA, UK, Sweden, Finland, Norway, France, The Netherlands and Spain.